Question #1: Why is it so hard to find unscented deodorant? I seriously don't want to trade one scent (bad) for another (annoying). Question #2: There was an SUV driving in front of me on Monday. On the back window (I couldn't get a picture, because my "driveby shooter"--Mark--wasn't with me), in large letters, it said, "I LOVE MY WIFE." I'm trying to decide how I feel about that. I appreciate the sentiment, but I'm pretty sure I wouldn't want that on my car. Thoughts? I see this picture every time I turn on my phone. The other day at the bookstore, my heart just swelled when Charlotte was reading a book to her brother. So that's about it for this week. It's your turn now. Thanks for sharing the music video....loved it! What an adorable picture of your cute grandies...that dress and sweater=yum! Those fabrics ARE beautiful , but I am not sure what I would pay for them? Your grandchildren are adorable! I'm with you on the deodorant fragrances, I have to smell all of them! 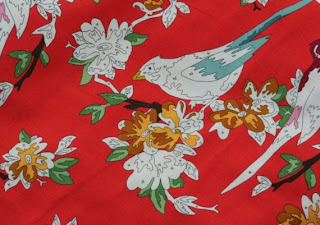 The most I have spent on a fq was £4.50, it was Melody Millers retro teapot fabric. Fabric is expensive in the UK so we all have to really want something to justify the price! Like the music. :-) Yeah, I've seen that bumper sticker before and thought it was a little weird. So, I'm with you on that. I love the fabric. So, how much is it and where can you get it? I think I'm willing to pay however much that llama fabric was, because I thought it was pretty pricey but I wanted it....like really wanted it. So, I paid it. That was getting close to my limit..... :-) I have tried to figure out the deodorant thing, too. I gave up. I don't think I would pay more than $10 per yd of fabric if that! Good deodorant is hard to find! OR how about some that is clear and not powdered?! Wow, you really win the randomness award! These posts always make me smile. We don't really do bumper stickers, or window stickers. We do have a child on board thing but that is more for the seriousness of were there an accident I would want them to see and remove my children from the car rather than the look at me I am cool with my window sticker! No flowers at the end though. I hate that when my favorite magazine goes out of print, which has happened several times. Interesting that so many magazines about organizing are out there. Does that say people have too much stuff?! I think it would be cool to see that bumper sticker, especially since spouses tend to forget to cherish each other after awhile. Fun to see pictures of you guys with your grandkids! Love all the random postings! I need to start posting a bit more randomness. My random postings still usually have something to do with sewing. I think I would like it if my husband came home with a big "I love my wife" bumper sticker. Of course then I would wonder what he did to deserve buying it. I have seen some Heather Ross fish print for $20 a FQ and even $100 a yard. I don't think I would pay that much. I did see it at $18 a yard and almost jumped on it. Those fishies are just so cute! I have a husband who detests scented deodorant. For the twenty years we have been married, only Dry Idea unscented roll on. I get it at Wal Mart, because I am fancy like that! I think the VERY MOST I would pay for a FQ is $10, and that would probably be for Heather Ross, too. On Sunday I went to one of the few Walmarts in the San Diego area that still carries crafts and fabric. Needed some stuff plus looking for a fan for the house. Not.a.single.one.on.the.shelf! I was disappointed, but not surprised. Came home and called a closer Walmart, the closest Target, the closest Home Depot-----NO fans. Then I got lucky. I called the next closest Home Depot and they had received a shipment on Saturday!! I drove my best friend to the airport, and right after I dropped him off, I made a beeline for that Home Depot. I got two of those big whole house fans for $44 a piece. Now THOSE I would have paid $500 a piece for...lol. Of course, on Monday the weather started to cool a bit, but if global warming continues, I'll need them next year. The only bumper stickers I would use would be bragging about my kids or grands, and as for deodorant, I like the scented ones, but like Self Sewn, I have to smell them all. I used to collect the magazine "Santa Claus" but then one year it just stopped. I was so disappointed. It had stories and crafts in it....sigh. oh, you're so funny!!! Love reading your posts. RE: the SUV, I have a feeling it was probably HIS car and not hers, and in that case I LOVE THAT!! If my hubby did that I would feel very special. :) Don't get me wrong, I do already feel special, but i admire a husband who would put that out there for the world to see. Like Heather D, I'm guessing it was his SUV. I buy Almay solid. No smell. Hard to find. Bed, Bath and Beyond, the San Diego store, has it and I bought four. I have found that if I want unscented deodorant, the best place in my town is WalMart. As for fabric my high price point doesn't allow for great fabrics as about $16 a yard is it and that has to be really special to me. I actually use the Dove Fresh Clean (or something like that) and you can't smell it at all. Even when it's working it's hardest, masks the nasty pit stink and no froofy perfumes. A lot of times you can find it in the travel section so you can try it in a small size before getting the big one. Interesting point about the magazines! Think they have tips on how to store magazines? I completely agree about the deodorant. I don't want to smell powdery or like a cucumber. I use the same kind as Audrey above and I don't mind it. I can tell it has a faint scent, but nothing that I can smell once I put it on. Great picture of your grandkids! Now that my oldest can read a little, I love seeing him try to read books to his brothers! Great randoms, thanks for clarifying about your parents!!! 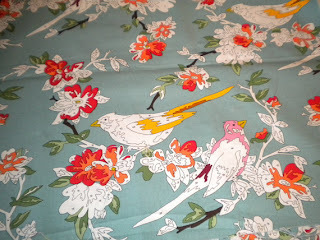 I swooned over that same fabric myself last year but decided it was way out of my range. However, if you really love it...??? I am hoarding some of the sky paint-by-number fabric, which I was able to find the year before, but I missed our on the birds and the deer prints. Just heard the last half of that Phil Phillips song today on the radio. I thought it was someone else and was surprised to hear his name at the end. I didn't understand why everyone was so gaga about him when he was on American Idol, but I really like that song a lot and he seems to have come into his own. Thanks for sharing so I could hear the whole thing. An unscented deodorant is hard to find. An effective unscented deodorant is even harder to find. My family has been very happy with Unscented Ban Invisible Solid antiperspirant/deodorant. We get it at CVS. Another great random post Cindy. I had a smile on my face the entire time, but burst out laughing at your final line! I love, LOVE that song also, and could just listen to it over and over! I love all the storage magazines. I always see them at SAMs Club. Coincidence? I would want "I love my wife" tattoed on the forehead, not a bumper sticker on the car! Silly guy! Keep it up--love your blog, my dear! Elizabeth E., who is coming out of the too-much-schoolwork fog. I've started using crystal deodorant, and it works well! i found mine at wal-mart, of all places.